So guys, here are some visuals that are coming straight from the Berlin Germany, does that sound exciting? It feels like whole Europe is becoming convinced. No doubt there were a lot of people in this field raising their voice to adopt this awesome recycling technique, so we being the part of this sort of movement feel great on the realization of this precious art. 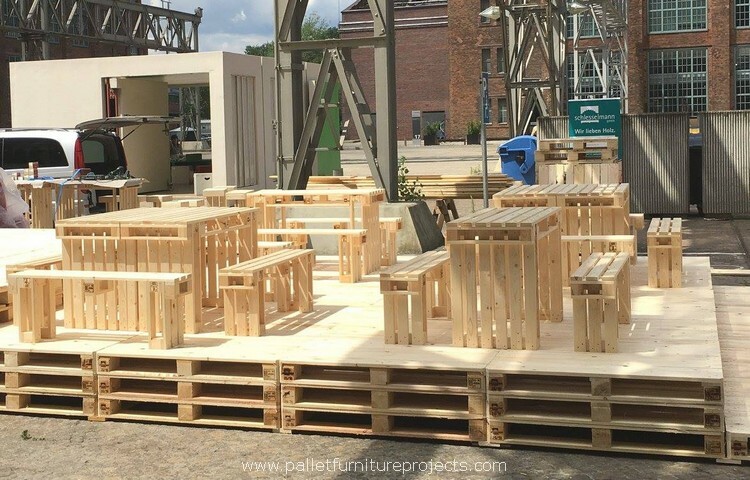 These visuals are depicting pallet terrace and furniture items that are being recycled and used in the Germany. 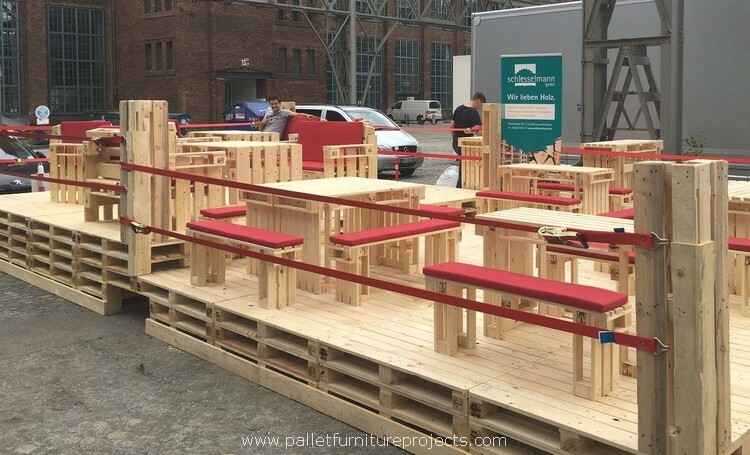 Here we are presenting a whole big idea of the pallet wooden terrace along with some furniture items. This is probably the beginning of the project when it was going to get started. We can see that a large number of whole shipping pallets is piled up here in a sequence. And the second most important thing is the quality of the shipping pallets which is exclusively clean. In the surroundings we can see the same sky high and wide buildings that have always been the identity of Germany. 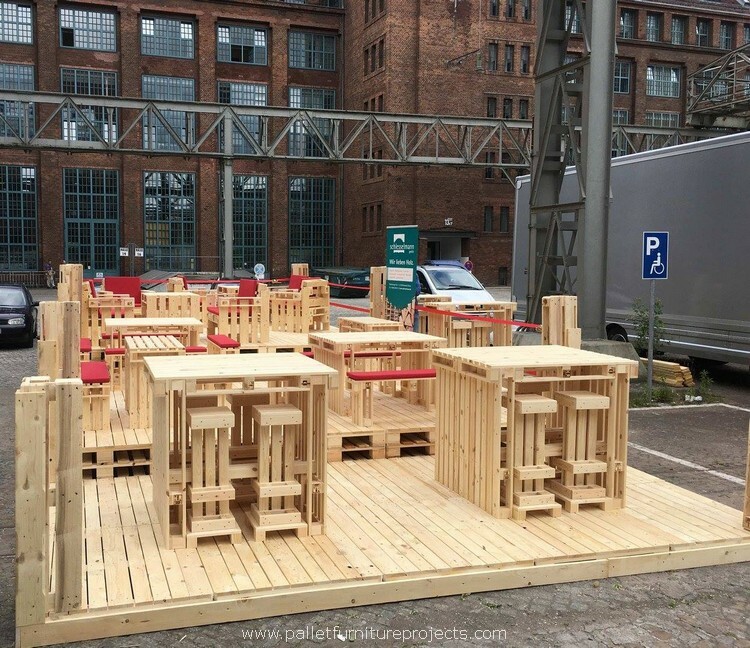 And this beautiful wood pallet recycled set up is placed right in the middle of these splendid buildings, this venue even escalates the importance of wood pallet creations. Now this is a closer look on the terrace and the furniture items after they have been upcycled and placed on the wooden deck or terrace. We can clearly observe that the color combination over here is simply marvelous. The bright or shocking red color is dominating the entire atmosphere. Before adding these red studded cushions and carpets the furniture range looked something like this. We see some traditional tiny benches here along with the matching and reasonably big pallet wood recycled tables. They are in a large number that means this is meant to be a public place or meant to be used commercially. If we also ponder upon the enclosed terrace area, this seems like the WWE arena where such foamy ropes are tied all around the ring. This has got a certain artistic essence in it. It feels like these wooden pallet pearls are literally enveloped and wrapped up in precious covering. 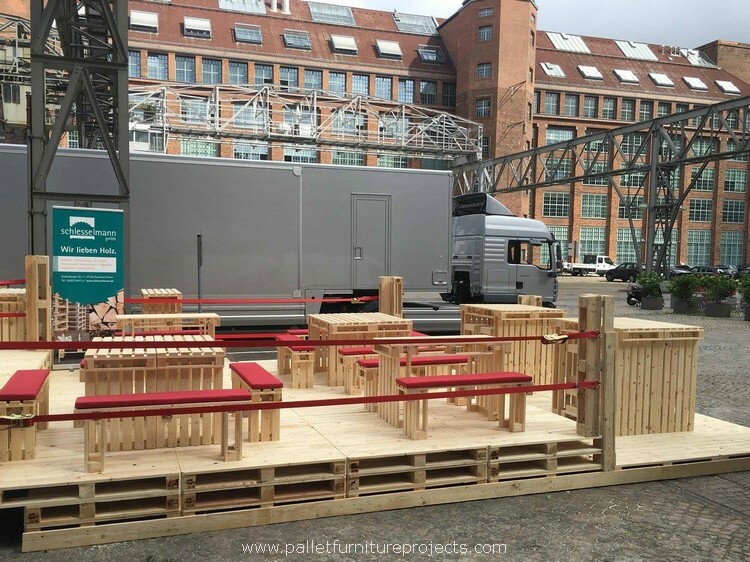 Once you are done with your food or chatter or whatever you do while sitting on these pallet wood creations, the stools are pushed inside the space available right below the table. 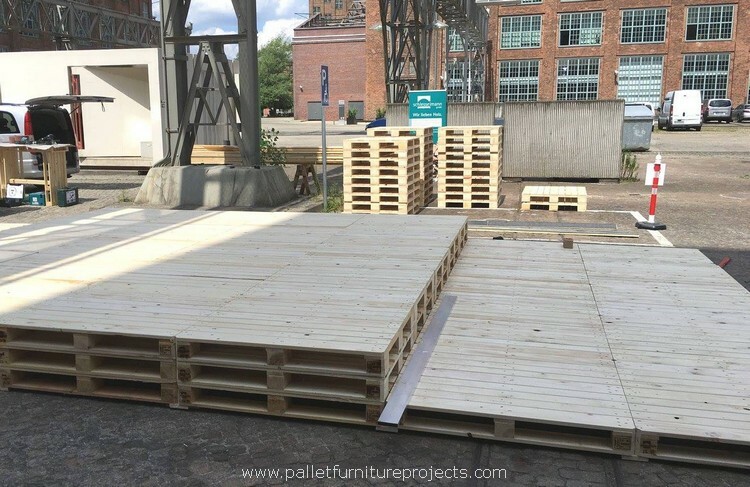 For each pair there is a separate wood pallet deck.